Introduced in 2006, this grand complication refines the design of its legendary ultra-thin perpetual calendar. It is a slightly larger than the ultra thin model. With its sophisticated movement and sleek classic design, the ultra-thin perpetual calendar is one of the most beautiful examples of Patek Philippe’s synthesis of technology and style. This slightly enlarged variation accents the ultra-thin case and optimizes the watch’s readability. 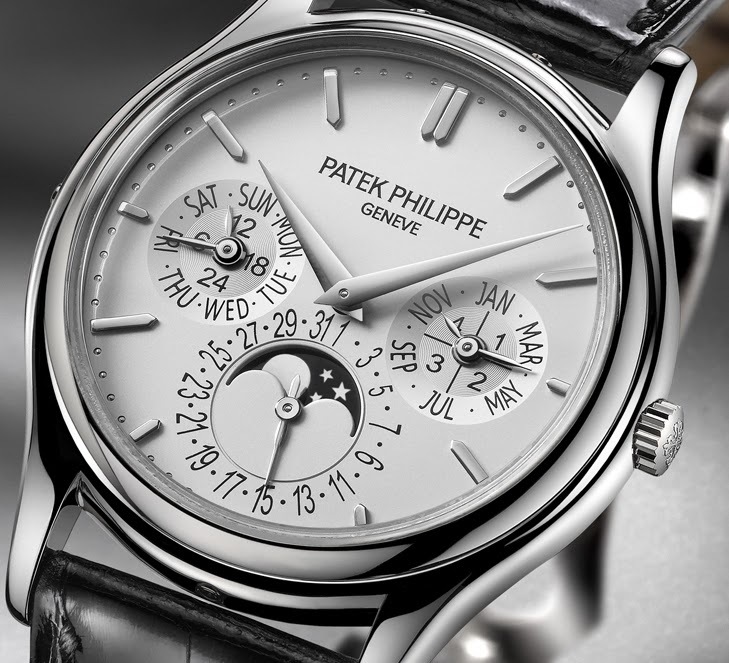 A classic complication par excellence, the perpetual calendar occupies a place of honor in the Patek Philippe collection. Many of these mechanical marvels were crafted for pocket watches beginning when the manufacture was founded in 1839 and for wristwatches since 1925. The hundreds of smoothly interacting wheels, pinions, cams and levers perform a veritable ballet as they emulate the course of time. 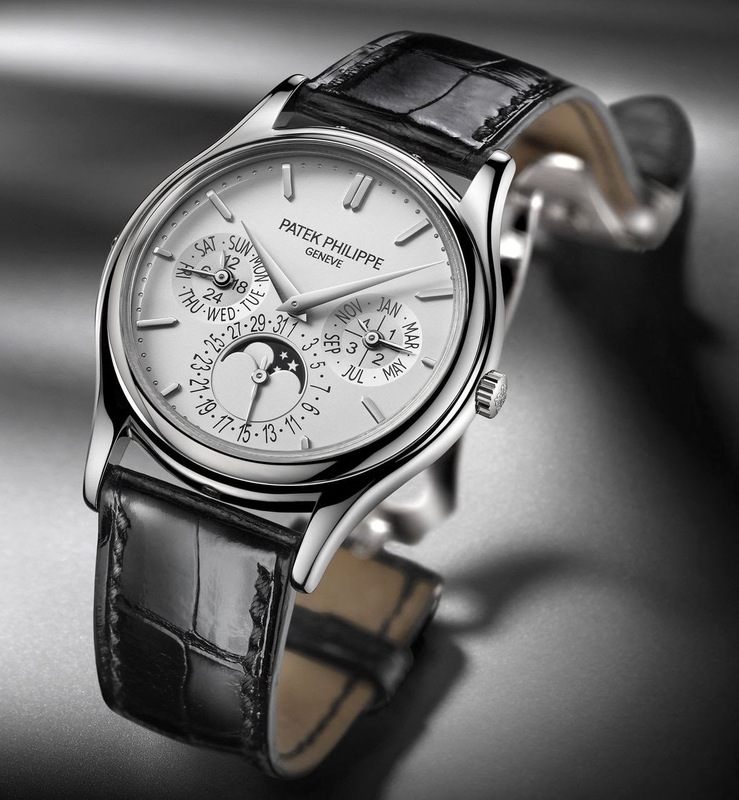 In 1985, Patek Philippe ushered in the new era of grand complications by crafting the Ref. 3940, the first highly complicated watch in regular production. This ultra-thin perpetual calendar, with its perfectly balanced dial, has become one of the workshops’ most popular complicated timepieces. Now, Patek Philippe introduces an interpretation of the original design. The round case of the new Ref. 5140 reflects the understated, symmetrical lines that contributed to the success of the Patek Philippe perpetual calendar. The diameter was subtly enlarged to 37.2 mm from 36 mm, emphasizing its ultra-thin silhouette. The concave bezel is replaced with a convex one to accent the perfect geometry of the case. The lugs exhibit a soft curvature for an elegant transition between the watch and strap. The Ref. 5140 is available in 18K white gold. To enhance the personality of this classic, Patek Philippe returned to its original dial, which epitomized purity and timelessness with its three perfectly balanced subsidiary dials, but changed one element. Since the date is the most important indication, the designers made it more legible by enlarging the diameter of the calendar dial at 6 o’clock while leaving the dimensions of the other two dials unchanged. Days are indicated at 9 o’clock and the embedded 24-hour dial distinguishes between day and night when the calendar needs to be adjusted. The dial at 3 o’clock displays the month, and the smaller hand shows whether or not the current year is a leap year. The perpetual calendar also includes a moon-phase aperture integrated in the date dial at 6 o’clock. Its mechanism is so precise that it will take 122 years and 45 days before the error relative to the true lunar cycle adds up to one day. The silvery opaline dial gently reflects light and features baton white-gold hour markers and two dauphine hands for the hours and minutes. Crafted entirely in the manufacture’s haute horlogerie workshops and featuring the prestigious Geneva Seal like all Patek Philippe mechanical watches, the self-winding caliber 240 Q movement is composed of 275 parts yet stands apart with its ultra-thin 3.88-mm profile. This is possible because of an off-center mini-rotor in 22K gold and the ingenious arrangement of the perpetual calendar and moon-phase mechanisms. With a mechanical memory spanning 1,461 days (four years), the perpetual calendar automatically displays the correct date, taking into account months with 31 and 30 days, as well as February 29 leap years. It does not have to be corrected until 2100, a secular year when the Gregorian calendar will omit the 29thof February. All calendar indications can easily be corrected via four push pieces recessed in the side of the case. The Ref. 5140 comes with a glossy black, hand-stitched alligator strap with the Patek Philippe fold over clasp in white gold. Like all of the workshops’ grand complications, it is presented with two interchangeable backs. Its original sapphire-crystal back reveals the beauty of the complex movement as well as the superb craftsmanship of every detail: beveled bridges, the circular grained plate, and Geneva striping on the bridges and rotor. The alternate solid-gold back, which should be fitted exclusively by an Authorized Patek Philippe Service Center, can be decorated with an engraved monogram or inscription.